With Snapdeal’s success and Groupon’s much hyped Indian entry with its acquisition of SoSasta, Coupon sites are dime a dozen in India. However, more companies are still jumping onto the bandwagon, vying for a share in this lucrative coupon business. Indyarocks, an Indian based social network is the newest entrant to it. 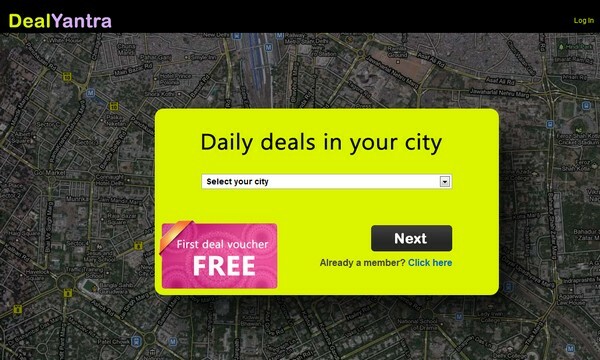 Indyarocks has launched a daily deal site called “DealYantra.com” which will offer hyperlocal deals in food, lifestyle, clothing etc across 6 major cities in India namely, the Delhi NCR region, Mumbai, Bengaluru, Chennai, Hyderabad and Pune. The first deal voucher is free upon registration and you can pay for the future deal vouchers through credit cards, debit cards or your netbanking account. Indyarocks will then send you deal vouchers via email, which can be printed and shown to the respective vendor to redeem the deal. Indyarocks will also send you daily deal alerts to your email, mobile and will soon be integrated to the 6.2 million strong IndyaRocks network. Sadly, there is no social media integration of any sort on the website. The concept of daily deals is picking up in India and through DealYantra we will be offering some of the best daily deals to Indian consumers. DealYantra will soon be integrated seamlessly with Indyarocks to gain instant access to the latter’s 6.2 million registered members. Although, it is yet to be seen whether DealYantra will have any impact on the already overcrowded coupon market in India. What do you think? Read next: Dating online: How do you choose which site is for you?